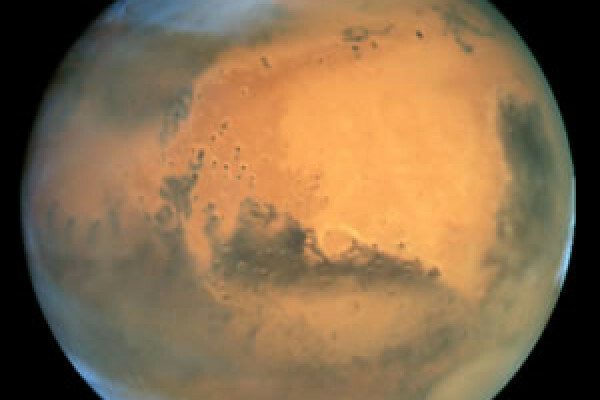 Mars is the fourth planet from the Sun in the Solar System. It lies just outside the orbit of the Earth. ... in fact, a very similar colour; a major constituent of Martian soil is iron oxide, which is better known as rust. It's the second smallest planet in the Solar System, half the size of the Earth. And yet it plays host to the largest mountain in the Solar System, a volcano known as Olympus Mons, which is three times higher than Mount Everest here on Earth. Its atmospheric pressure is less than a 100th of that on Earth. On the Earth that's equivalent to the pressure at an altitude of 100,000 feet. At such low pressure, liquid water would evaporate almost immediately. So while there's plenty of water on Mars, it's all locked up in ice reservoirs beneath the surface. And what little air there is on Mars is mostly carbon dioxide, with barely a trace of breathable oxygen. At the poles, this gets so cold that it forms frost. Not made of ice, but made of solid carbon dioxide at -120 C.
So, the surface of Mars is a harsh place. Moreover, with no magnetic field to deflect it, Mars' surface receives the full brunt of the ionising radiation emitted by the Sun. But it might not always have been that way. The surface of Mars shows signs of past water erosion. So, it probably had a thicker atmosphere and a warmer climate in the past. And may well have been much more habitable back then. Mars has two moons, Phobos and Deimos, named after the sons of Mars in Greek mythology. But they're much smaller moons than our own, measuring less than 25 km across. They orbit so close to Mars that they're difficult to spot, even with a sizeable telescope. And it's quite a mystery where they came from. They may well once have been asteroids that slipped into orbit around Mars. More spacecraft have been sent to study Mars than any other planet. The success rate has been low; of 33 missions launched; only 15 have returned useful data. ... but the latest rovers to land on the Martian surface, Spirit and Opportunity, have lasted over six years, well beyond their 90-day design lifetime. Is there evidence of Earth meteor impacts on the moon?